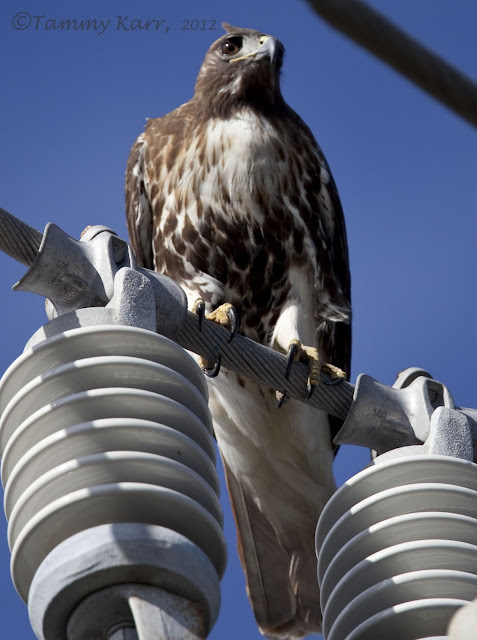 Red-tailed Hawks are common in this area. 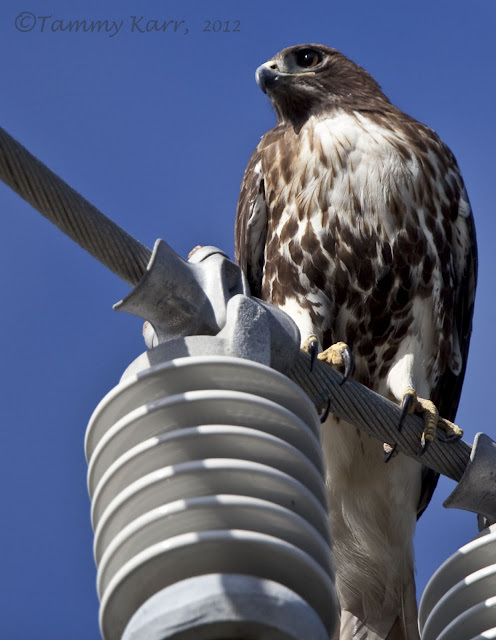 I saw this large raptor perched on power line (certainly not the prettiest perch) close to my home. The squirrels in the area most certainly want to steer clear of those talons! Beautiful bird and super photographs. Interesting perch. Love his soft chest and big feet and look at that blue sky! These are fantastic shots!! Wonderful to see this great raptor. Great look at the eye and strong bill of this raptor Tammy! Wow Tammy, those are great images, looking at those talons its not the squirrels that should worry, its the cats and dogs aswell !!!! Those are gorgeous shots against the blue sky...power line and all! Lovely shots Tammy, every shot seems to have a lovely blue sky, not jealous at all. Majestuosa esa rapaz en lo alto, y con esa mirada tan penetrante, buenos disparos. I always enjoy seeing raptors. Terrific photos Tammy. A brilliant bird Tammy, well-photographed. I could do with one of these in my garden for when the suirrels steal all the bird food! Yes, those talons are incredibly vast, beautiful photos. Lovely shots Tammy. Do you ever get a feeling that it really is their choice that the squirrels aren't the only ones who should be careful? We have similar birds in Australia, Black and whistling Kites, who don't mind sitting near you, or hawking near you and I sometimes gt the feeling my shoulders would be a nice perch! Lovely pictures of the hawk.